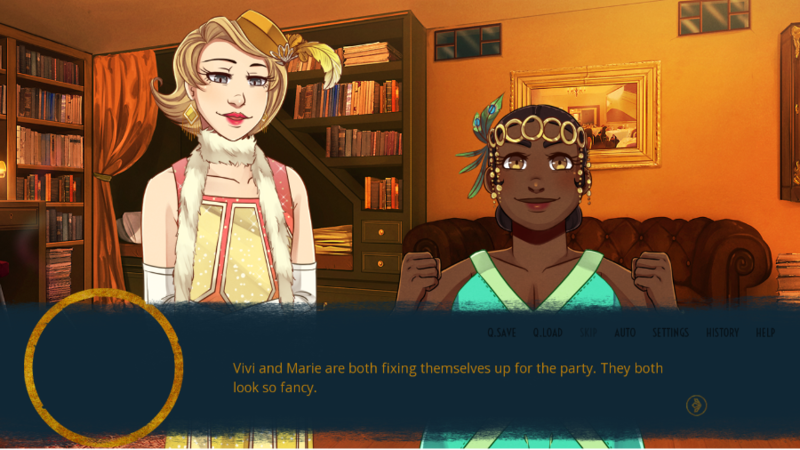 The Blind Griffin is a NanoReNo game from 2015, an otome game set in a fantasic version of 1920s America, made by Asphodel Quartet. The story follows ??? 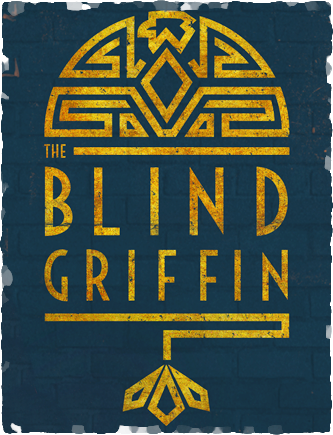 ?, a nameable protagonist as she follows magical signs that pull her towards a convenient job at a speakeasy called The Blind Griffin. 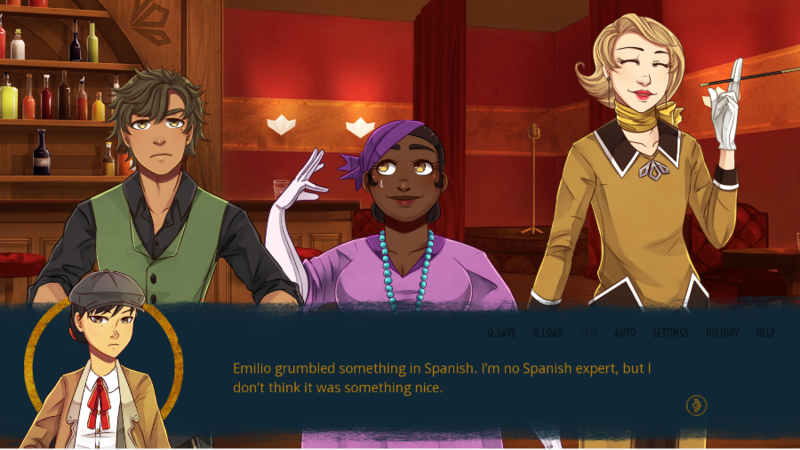 There, she gets a job as a bartender, meets a trio of boys as well as some lovely ladies, and gets to spend a few months learning about magic, history, love, and whether or not she wants to smooch someone. Telling you about deep specifics in this game would be a bit tricky, because it really is quite short. Like, action movie short. Like, an episode of a drama short. You could probably blur through your first playthrough in an hour if you weren’t taking notes like I was and then replay it again doing different things in half that time. With that in mind, you’re not going to get a lot of spoilery stuff in this review – there just isn’t the time. You can get The Blind Griffin for free on itch.io, and it’s definitely worth the time to play through. There’s no need to be particularly specific about it – this is a good little game. But now, let’s talk about form. I really like this game, and part of why I like it is the non-focal positives, the sorts of things that this game sees fit to put in the game without necessarily making it the central focus of the game. This game has a trans woman in it, and she’s lovely and good and it doesn’t do anything messed up with her that I found. This game has a fat black girl in it, and she’s lovely, and great, and again, nothing messed up with her that I found. Crucially, though, these characters are part of the story and the setting, and they’re like that without being the purpose of the story it is. I watched a long-form lets-play of OzMafia recently, and it was deeply awful. Part of what made it awful wasn’t just the focus stuff – the stuff you, the player were meant to interact with, but also the passive stuff, the background information. The game figured it could make fun of fat people on a bit part character, figured it could offhandedly violate boundaries and spaces as meaningless beats, that kissing someone without their consent wasn’t a thing worth drawing attention to with any kind of ceremony or remark. And that stuff was all just there in the background. It felt like it could make that into background information, that none of it was worthy of remark. In The Blind Griffin, things like a happy fat black girl and a happy trans woman who runs a business are all things that can be background. They are things that can be fairly unimportant. And that means they can be normal. That means they can be pretty unremarkable, which may seem weird, but it’s also really important how unimportant those characters can be. This is why I think about this game, which was made by people who I suspect have values closer to my own, a lot, and I think about it in comparison to the visual novels I grew up playing, and the people who were trying to emulate them once I became an adult. It’s why I want more VNs that come from a place like mine, rather than VNs that come from a place of mostly other VNs. The VN, as a game genre, is a really interesting vehicle because it takes a really familiar, basic game design and makes it interesting to proceed through. 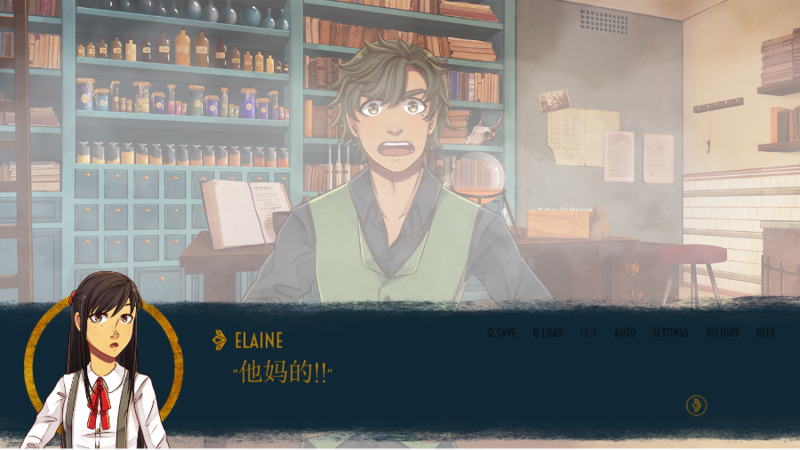 When you cut into the structure of a Visual Novel, when you start to plan one out, is The whole genre of otome game can be seen as a really pretty maze. Mazes, I have remarked in the past, are bad. They’re really boring as a way to extend gameplay, and they’re used in old videogames because they are asset-light. Indeed, making a maze out of identical rooms (twisty little passages) makes them more difficult, which makes them harder to do, which makes them seem more challenging. 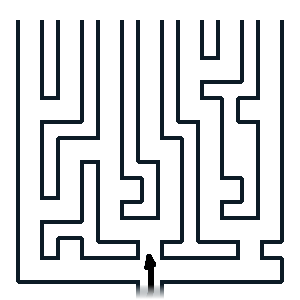 Some games make the play experience harder with distractions in the maze, but the maze as a core game design tends to always be used badly. I complain about mazes in games for a lot of reasons, but as with almost all game mechanics, there are places they can be used well, and one of them is in the always-forward otome game, which constructs the maze around you, makes every step on that maze’s path different, and distracts you from the fact that you’re in the maze. Now, there is one tiny problem I have with The Blind Griffin. It’s not a big deal. It’s barely a deal at all. It’s – it’s just that in this game, text takes a fraction of a second to load. Now, that’s not – really – a problem. But I read fast, and I guess I’d say my reading pace is aggressive, and that means that when playing this game, I kept noticing the way the game paused and faded while I was reading a character’s dialogue. This will not bother you, I’m sure. I turned the speed up to the max but I still kept finding that happening. On replays, you can fast-forwards through text you haven’t seen, so that’s cool. But the first time through, the Blind Griffin really frustrated me. Other than that? This is a great game for no money and it has some lovely art, you get to hang out with some fun characters, and there’s a dog. What more can you want?